Cardinals, in their bright red plumage, seem made for Christmas. The evergreen friends (Christmas cardinals) personalized Radko ornament captures an idyllic winter scene that cheers the heart. This beautifully carved depiction is formed in high-quality Polish blown glass and painted by hand with lovely seasonal colors. We'll be happy to hand letter a name and the year onto this ornament, one of the Radko ornaments personalized for the recipient that can be shipped in the Radko gift and storage box if you choose. 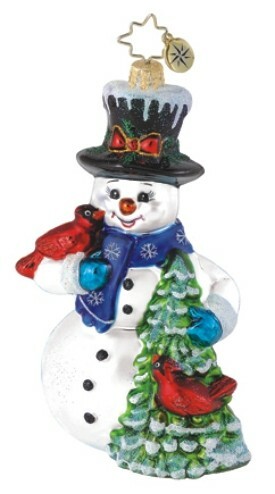 Brighten the holidays this year with the wonderful Radko evergreen friends cardinal and snowman Christmas ornament.